If we aren't at our best, how can we possibly do our best work? With my guests, we'll look beyond the usual self-care advice to explore beyond-the-box deep self-care ideas for Change Catalysts. What can we discover by talking with authors, thought leaders, and Change Catalysts at the growing edge of their fields? If we step beyond the comfort of the ideas we already hold, what inspiration will we uncover to enhance and deepen the way we think about change, the way we work, and what we hold as possible for our clients? Change Catalysts are often called to step into a new chapter of their business: to reach a new audience, to share new work, to have more of an impact, to feel more fulfilled. Often the shift to our new work is an evolution. What can we learn by talking with Change Catalysts who are evolving their work? In this episode, Carol and her guest, Mary McGill, MA, LPC, explore how different kinds of anxiety impacts us, how our culture discourages us from voicing our anxiety, and why it is important to know that it is natural for inner obstacles to arise as we stretch in new ways. Discover simple, effective ways to pivot your attention from your anxiety to why you are drawn to take inspired action. Gain access to tips you can use in your own life or share with your clients. By holding a sanctuary space of co-creative wholesomeness, Bobbye guides sensitive, radiant evolutionary healer-creators to their next highest expression by transmuting their inner disharmony. They reconnect with and embody their inner grounded, centered self to release the full potential of their expression into the world via messages, books, multi-media creative projects, and practices. Feeling called to evolve your work with clients? After meeting in several online business classes, Carol and her guest, Bobbye Middendorf, realized that the traditional “Build Your Business” approach was not working well for either of them. They had no interest in building an existing business; they were each actively evolving a new work. In their quest to succeed, they began meeting regularly to share their journey and support each other in stepping into new clarity and confidence. Looking back they realized how powerful and instrumental this trailblazing journey was in bringing their new work to life. During this episode they share their individual journeys and the practices and processes they co-created to tap into the wisdom of their ideas, their work, and themselves. We all have inner nudges, or intuition, according to our next guest, Leanne Babcock. In addition to sharing how her inner nudge has her living life on the growing edge, Leanne also describes various ways we can access our own inner wisdom, prepare ourselves for client sessions, and guide our clients to awaken their own connection with their inner nudge. Leanne Babcock, an expert in intuition development is a coach, speaker, intuitive and an author. Through her one-on-one coaching and courses… her work heals hearts, transforms the mind and sets the spirit free enabling people to naturally take actions to fulfill what is truly in their heart. In times of great change, transitions and trauma impact us emotionally, physically, and energetically. In this show, Carol and her guest, Dafna Golan-Carbone, discuss how clients who are out of balance can cultivate peace within and around them. When Change Catalysts know what to look for, they may play an important role in helping their clients receive the support they need to release the trauma and come back into a state of balance and peace. How to stop an emotional downward spiral...on the spot! In times of great change, transitions and trauma impact us emotionally, physically, and energetically. Dafna uses a variety of modalities that address energetic and physical structures to help her clients cultivate peace within that ripples out into their lives. In this episode, Carol and her guest, Nick Turner, discuss an ancient symbol called the enneagram that has powerful uses in today's changing world. They explore how the enneagram of personality types can help people understand themselves and others, how Change Catalysts' work with clients can benefit from this understanding, and what the enneagram has in common with Carol's transition model, the Seasons of Change. Download Handout for additional diagrams. Download Handout for show handout with diagrams. In times of change and uncertainty, a powerful way to reconnect with ourselves, our communities, and the web of life is to participate in thoughtfully designed ceremonies and rituals. In this episode, Carol and her guest, Susan Wulfekuhler Sanford, explore how these purposeful experiences create a container for moving energy and expressing emotions during both personal transitions and changes that touch us all. They'll also offer ideas for simple rituals Change Catalysts can use in their own practice and share with their clients. Through her work, Susan helps people navigate times of change through ceremonies, rituals and reconnecting with the soul. Episode 5: Change Catalysts: Nourish Yourself First! When Coaches, Healers, and other Change Catalysts are out of balance they struggle to feel strong enough to do their work. In this episode Carol and her guest, Tiffany Thoen, explore the importance of nourishing ourselves first so we have the energy and stamina we need to step into our work and out into the world more fully. Read Tiffany’s Womanifesto to explore her view of how knowing that you are valuable and worthy of love and respect, no matter what, creates a powerful ripple effect in the world. Download Coach Tiffany’s hunger scale (a silly spin on traditional hunger scales). Interested in more from Coach Tiffany? Join Coach Tiffany’s Deserving Women community on FaceBook to have access to great info, videos and support. Tiffany helps women leaders stop wasting their mental and emotional energy struggling with food and their bodies. Using the Intuitive Eating Model, she supports them in healing their relationship with food to finally find balance, freedom and satisfaction with food. with Carol McClelland Fields, PhD, BCC as the GUEST! A trailblazer in this field, Carol has watched transition trends change significantly over the last 35 years. She also sees potential for even more change in the years ahead. She believes that Coaches, Healers, and other Change Catalysts are on the front lines in our changing world. inspiring and engaging to you. 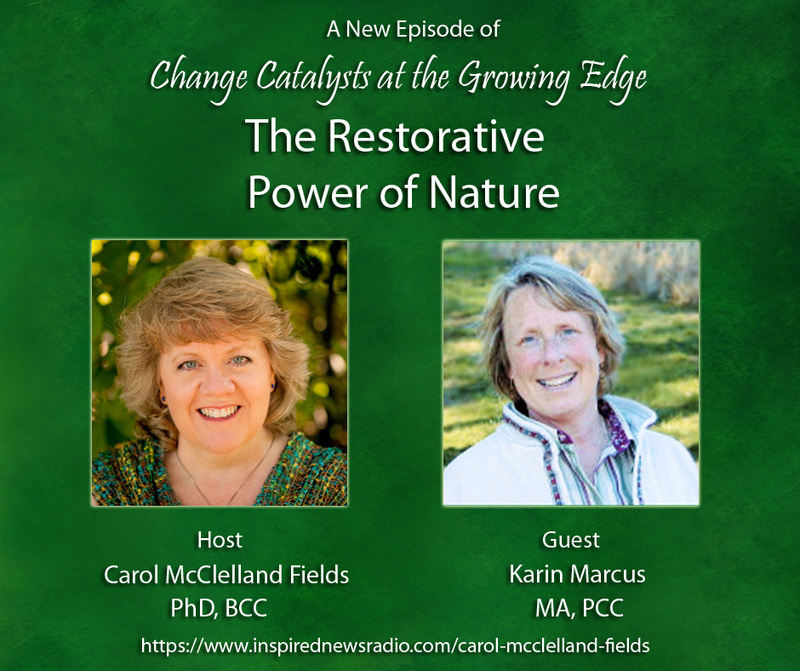 In this episode, Carol and her guest, Karin Marcus, explore how nature can be a physical, emotional, and spiritual source of comfort and hope during times of uncertainty and transition. Gain insights you can use in your own life and share with your clients. Karin’s Book: Birding Through Cancer: A Seasons of Change Journey, is available on Kindle and Nook. You can also purchased a signed copy at the author’s price at the link provided above. Interested in learning more about the restorative power of nature? Search for “forest bathing” on the Internet and you will find additional books and articles about this fascinating topic. When you are struggling to make sense of your life, business, or world events, how do you shift your focus to move forward with hope? How do you support your clients in doing the same? In this episode Carol explores Signs of Hope with Nancy Seibel of Keys to Change. Department of Hope Blog: An array of posts exploring the topic of hope. The Write Way to Well-Being Guide and Workbook: This e-book helps you build resilience and well-being, your own personal signs of hope!